Thank you, I just received my order. I viewed some of the DVDs and want to say Bravo! They are extraordinary. I teach our Catholic Faith to third graders, and work with a Catholics come home ministry. I am so excited to incorporate your work into the curriculum this fall. God Bless you and your good work. Mormons are a group that started in the 1800's. 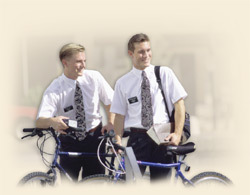 They have "elders" (engraved on their nametags) who ride bikes around knocking on people's doors. They are usually 18-22 years old. The last time I looked up "elder" in the dictionary it meant "older person." Not sure how a 19 year old acqiures the title and office of "elder." They know about as much as any other teenager. They spew the Mormon tradition they have been indoctrinated with and too many Catholics are left speechless because of their ignorance of their own Catholic faith. On Teresa Tomeo's show today on Ave Maria Radio, the question arose about their teaching on the "Great Apostacy" which claims that after the Apostles the Church fell away into heresy. It seems they forgot that Jesus taught that he would be with his Church always, even to the end of the age (Matt 28:18-20), and that the Gates of Hell would never prevail against it (Matt 16:18-19). Their teaching makes a liar out of Jesus by claiming that he let the Church fall for 1800 years until Joseph Smith came along. 6) "Simon Peter went up and drew the net to land, full of large fish, a hundred and fifty-three; and although there were so many, the net was not torn." (John 21:11) Here the net represents the Church pulled unto the shore of eternity by Peter at the end of time. He brings the net filled with fish to Jesus. The net is not torn (Greek word for schism). St. Irenaeus (ad 120-200): "As I have already observed, the Church, having received this preaching and this faith, although scattered throughout the whole world, yet, as if occupying but one house, carefully preserves it. She also believes these points of doctrine just as if she had but one soul, and one and the same heart, and she proclaims them, and teaches them, and hands them down, with perfect harmony, as if she possessed only one mouth. For, although the languages of the world are dissimilar, yet the import of the tradition is one and the same. For the churches in Germany do not believe or hand down anything different, not do those in Spain, not those in Gaul, not those in the East, nor those in Egypt, nor those in Libya, nor those which have been established in the central regions [Palestine] of the world." "I'll never forget the time I showed a co-worker (PCA) the verse from John 20 about Jesus giving the disciples the authority to forgive or retain sins. Her jaw dropped open. She said, "I've read John 20 times and I've never seen that verse." Then she noticed that I had a "Catholic Study Bible," and she got this big smile on her face and said, "Oh…wait a minute…this is a Catholic Bible. Let me go get my King James." A minute later she walked back into my office as she was flipping through her KJV and when she came to John 20, she froze and literally could not speak for several seconds…she just stared at me. At which point I took her on a Catholic tour of the Bible for the next couple of hours. She never came into my office and told me where the Catholic Church had "gotten it wrong" again…which she had done several times previous to that encounter."